Anyone who has spent autumn or winter in Japan knows how exciting it is to hear the sound of the “yakiimo man” driving through their neighborhood in his mini-truck. His iconic call to come enjoy a hot sweet potato has children eager and adults nostalgic for the days when they ran out into the cold to get these stone-baked treats. Whether the yakiimo man sings his own melancholy song or broadcasts it from the loudspeaker mounted on his truck, the wintery tune brings smiles even in the coldest weather. 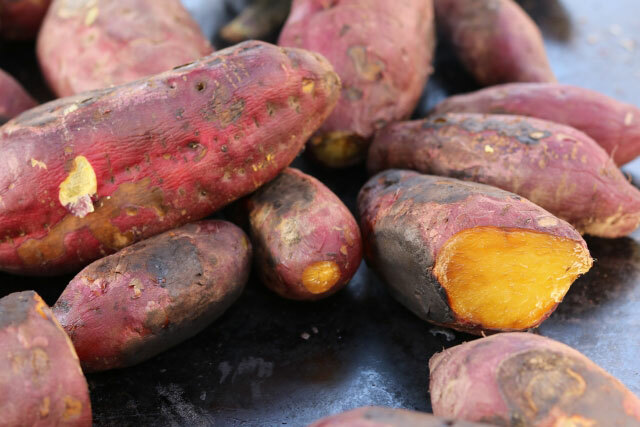 Yakiimo is a sweet potato, most typically of the satsumaimo variety found in southern Japan. These sweet potatoes were brought to Japan from Central America by way of China in the late 16th century. Their cultivation was limited to the subtropical southern region of Kagoshima Prefecture for many years, until a widespread rice famine struck the country in the mid-18th century. In heavily populated areas, especially near modern-day Tokyo, crop failures led to major food shortages, starvation and civil unrest. Konyo Aoki, a local scholar, experimented with growing satsumaimo in the Kanto region in order to help feed the hungry Japanese people. This colder northern area was traditionally thought to be inhospitable to growing satsumaimo, but Konyo was able to help them flourish, and their popularity soon spread. Satsumaimo have reddish-purple skin and cream colored flesh, starchy and sweet. The yakiimo man bakes them in hot stones placed inside a propane-powered, steel stove in the back of his mini-truck. He bakes the sweet potatoes until their skin is browned and wrinkled and the insides are soft, giving them to hungry people wrapped in paper. You might hear those same hungry people say “Achi! Achi!”, or “Hot! Hot!” as they hold the fresh sweet potatoes. 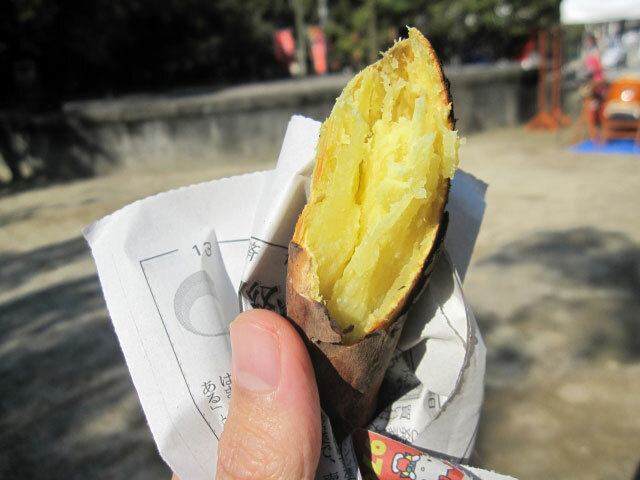 Yakiimo can now be found in many convenience stores, but nothing replaces the experience of breaking them open and taking the first savory-sweet bite from the one purchased directly from the yakiimo man. Until next time, stay warm and don’t forget to look out for next month’s post about Japanese street food! Refined, delicate, purposeful, seasonal, healthy, flexible… all of these words describe the essence of Japanese cuisine, or washoku. As part of our exploration of the essentials of Japanese cooking, we’ve learned about the ingredients and foundational foods at the core of this cuisine. This month, we explore the principles of the washoku tradition that guide kaiseki ryori and shojin ryori. This philosophy is best illustrated by an ichiju sansai meal, which consists of a bowl of rice, a bowl of soup and three side dishes, typically comprised of a piece of grilled fish or meat or tofu, pickles and simmered vegetables. 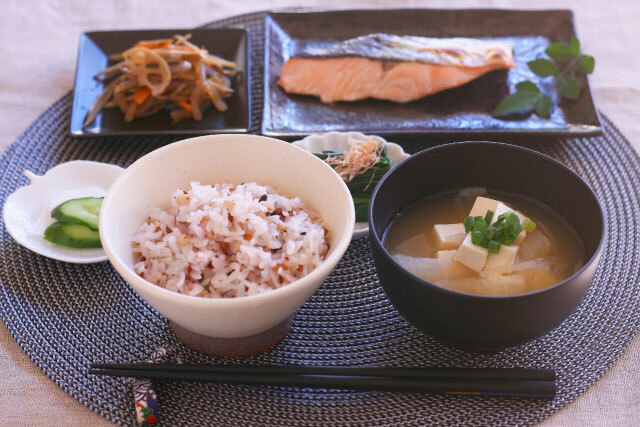 An ichiju sansai meal is the typical meal served at lunch and dinner in Japanese households and is loosely translated to mean “well-balanced meal”. Both kaiseki ryori, Japanese haute cuisine, and shojin ryori, Japanese temple food, rely on this framework. Kaiseki ryori (as seen in the title image) offers a richer, more elaborate but no less balanced version of an ichiju sansai meal. Kaiseki meals were originally prepared as part of formal Japanese tea ceremonies, and were later served to nobles as a sign of wealth and class. 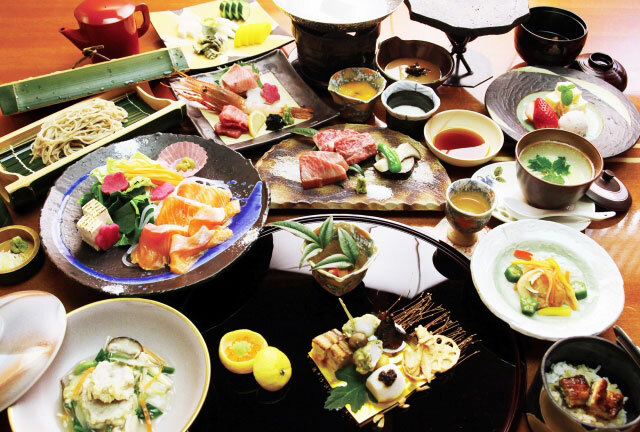 A kaiseki meal consists of four courses or “sets” offered in a prescribed sequence. The starters set includes an aperitif course (skokuzen-shu) in which a small cup of sake or wine is served, followed by an appetizer course, consisting of decoratively prepared bite-sized appetizers served on a long dish called a hassun. The starters are followed by the main set, which consists of a soup course (suimono), a sashimi course (otsukuri), a simmered dish (nimono), a grilled dish (yakimono), a deep fried dish (agemono), a steamed dish (mushimono) and a pickled dish (sunomono). 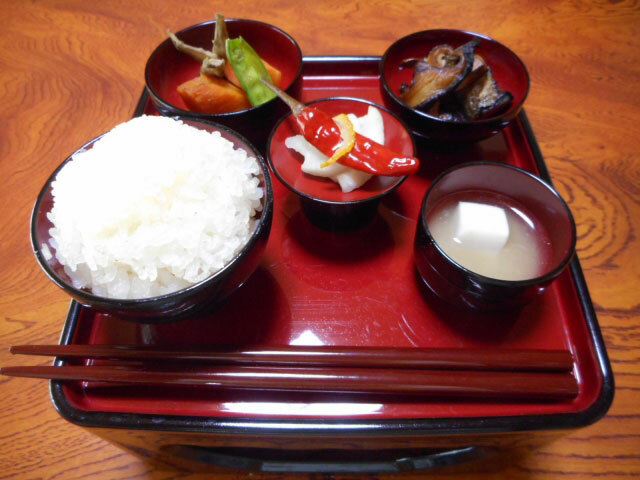 The third set, called a shokuji set, includes a bowl of white rice, miso soup, and pickles (tsukemono). Finally, the meal is concluded with a small dessert of fruit, confections, sorbet or ice cream. Though there are many dishes in a kaiseki meal, each dish is served in small proportions, slowly and with great attention to detail, and with the utmost in hospitality. Even seating, tables, flowers, quiet and privacy are considered in the preparation of a kaiseki meal! Today, kaiseki meals are served in Michelin-starred and fancy Japanese-style restaurants and high-end ryokan, or Japanese-style inns. Devotional or temple cooking, known as shojin ryori, hones the concept of “harmony of food” into a set of offerings that are based on Buddhism’s inherent respect for living a life that eschews doing harm. This type of cuisine became popular in the early 11th century when Buddhist monks used this way of “earnest commitment” to procure, prepare, serve and eat their meals. At its most fundamental nature, shojin ryori is vegan, consisting of no animal products, uses gentle seasonings and reduces waste as much as possible. A typical meal consists of a few vegetables such that all parts are used, the leaf, the root, the skins, prepared using simple techniques like blanching, simmering and braising, along with rice, soup, pickles, beans, legumes and tofu. Each item is prepared simply, without strong tastes such as garlic, chilies or wasabi. The entire meal is prepared with quiet thoughtfulness and eaten with reverence. Restaurants that serve shojin ryori meals offer more creative versions of this honest, simple food and are becoming more popular as people are gravitating towards a plant-based diet. Both kaiseki ryori and shojin ryori style meals make a conscious effort to use seasonal ingredients, taking care to respect when foods are most fresh and full of their inherent flavor. These two styles of cuisine are also deeply concerned with how food is presented, including how ingredients are cut, arranged, plated and served. The utter refinement of washoku in these cooking styles shows you the wonderful variety of Japanese cuisine. Which ones have you tried? Which one is your favorite? Let us know in the comments below! 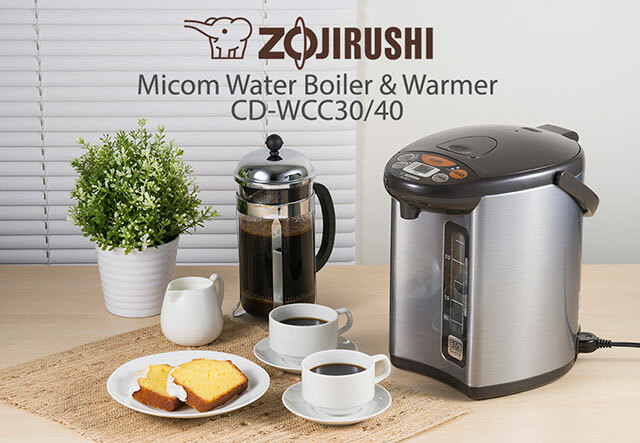 The Zojirushi Micom Water Boiler & Warmer (CD-WCC30/40) is one of our newest water boilers, and it’s a great addition to your home or office! Designed to heat water quickly and maintain it at the selected temperature, this water boiler helps you have hot water available for brewing tea or coffee, or preparing foods like oatmeal, instant noodles or blanched vegetables throughout the day. The CD-WCC Micom Water Boiler & Warmer is available in 3- and 4-liter sizes and comes with non-stick coated stainless steel interior, and water contact zones that are BPA free. It has an easy-to-read water level gauge, a swivel base and a sturdy handle for safe portability. 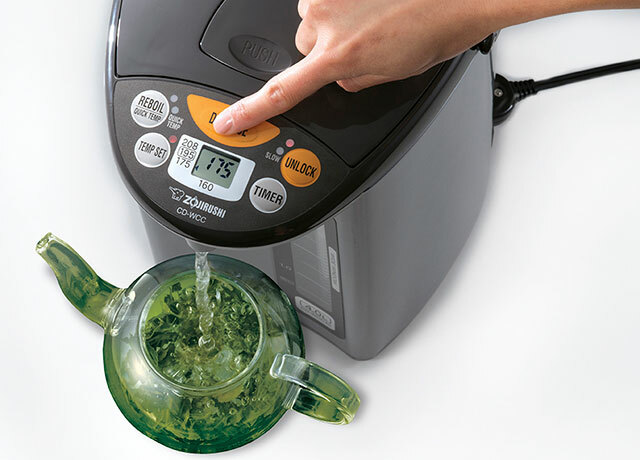 Brewing tea becomes an art when using this water boiler. Delicate teas such as gyokuro green tea are best brewed at 160°F, while 175°F is the ideal brewing temperature for Sencha green teas. Oolong tea is best brewed at 195°F, and at 208°F, the hot water is great for brewing black teas and herbal teas. The Zojirushi Micom Water Boiler & Warmer maintains water temperature perfect for brewing teas by letting you select one of four keep warm temperature settings from the LCD display on the main panel. This Micom Water Boiler & Warmer also comes with an optional QUICK TEMP MODE, a great feature for those who use filtered water or who need to quickly heat water to 160°, 175° or 195° without first bringing it to a boil. This water boiler also makes dispensing hot water clean and safe by using an electric dispensing system. Once your cup has been placed under the spout, press the UNLOCK button, then press the dispense button. The additional Café Drip Dispensing feature even allows you to brew Café Drip coffee by decreasing the amount of water to 60% of the normal dispensing mode. The LCD panel shows the actual water temperature at all times, and the convenient delay timer function saves energy by shutting off electricity to the heater until it’s time to heat water again. This water boiler also comes with multiple safety features including auto shut-off, which turns off the machine when there is no water in the inner container, an automatic dispense lock and a removable magnetic power cord which easily detaches from the machine to prevent scalding and other accidents. We hope you love this water boiler as much as we do! Share your favorite recipes with us in the comments! By now you know how to store, measure and wash rice so that it’s ready to be cooked. This month, we get to it! 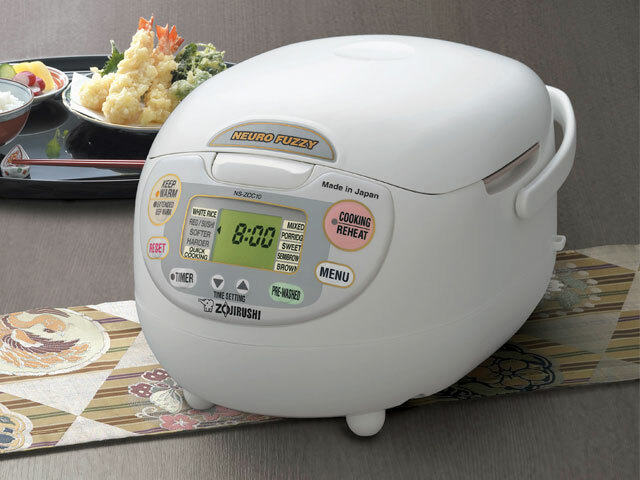 We share our secret for cooking perfectly delicious rice in our Zojirushi rice cookers. Rice requires the correct ratio of grains to water, even heat and controlled pressure to cook well. Along with being easy to use and stylish, Zojirushi rice cookers are designed with these requirements in mind. A variety of features, including water level lines on the inner cooking pan, pre-programmed menu settings and temperature control give you perfectly cooked rice every time. There are three main categories of rice cookers, with each representing a different level of rice ‘deliciousness’. Micom rice cookers use a microcomputer, or “micom”, chip to control the way rice is cooked. The microcomputer programs in soaking time, and adjusts cooking temperature and time according to readings from internal sensors. In addition, most Micom rice cookers have three heaters surrounding the inner pan—one at the bottom, one at the top and one surrounding the inner pan from the sides—for even heat distribution to ensure fluffy rice. Building on micom technology, Zojirushi’s IH + Micom rice cookers utilize sophisticated induction heating technology, which allows the inner pan to become hot very quickly using a magnetic field. The magnetic field also allows the heat to turn off very quickly, as opposed to an electrical heating element, to lower the temperature as quickly as possible when needed. This enables the rice cooker to make finer temperature adjustments for precise heating. 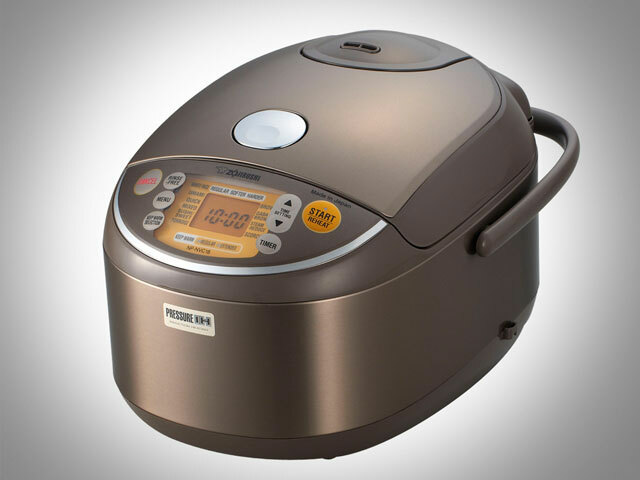 Zojirushi also has a rice cooker that adds pressure cooking to the induction heating and micom technologies, called a Pressure + IH + Micom rice cooker. Cooking with pressure and high heat brings out the rice’s best characteristics. 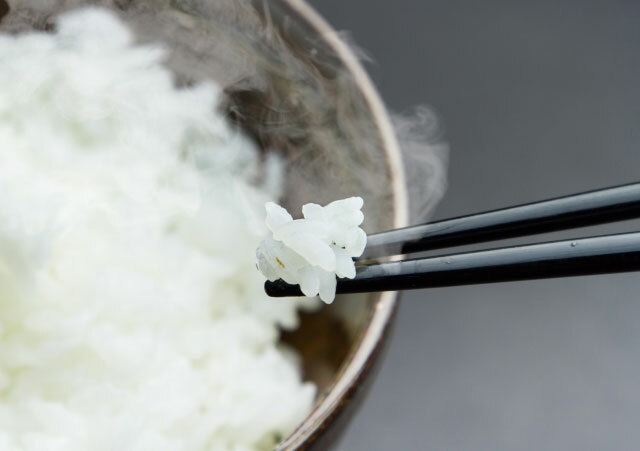 A pressurized system alters the structure of starch within each grain of rice, converting the indigestible beta starch into a softer, palatable alpha starch. Pressure cooked rice is fluffier, has superior texture and a pleasing mouthfeel. 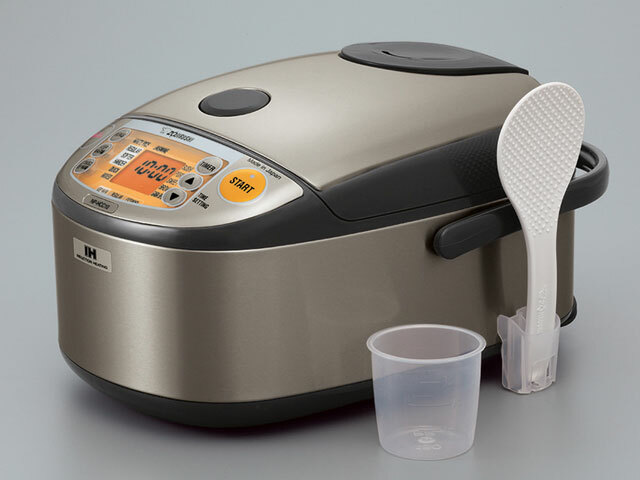 Whether you use a Micom rice cooker, an IH + Micom rice cooker or the most sophisticated Pressure + IH + Micom rice cooker, make sure to follow the steps for correctly storing, measuring and washing your rice, and you’ll have delicious rice, hot and ready to eat, every time! We hope you’ve enjoyed this series. Rice is truly a universal food, spanning cultures, cuisines and geographies, and we bring our passion about this grain to all that we do. 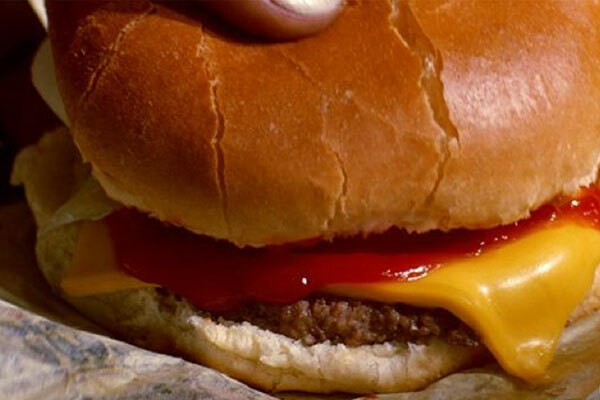 How well do you know your hamburgers? 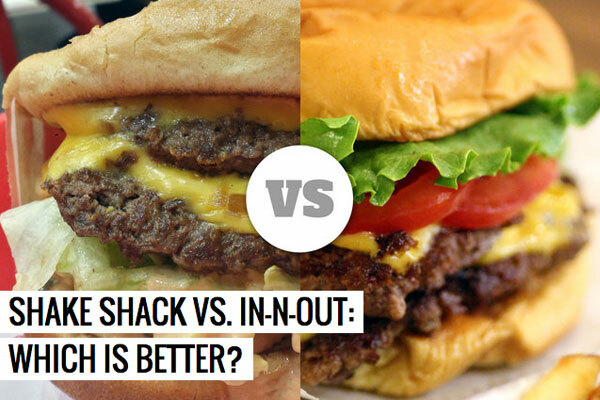 By no means am I a burger geek or anything, but I give in to the craving like everyone else. 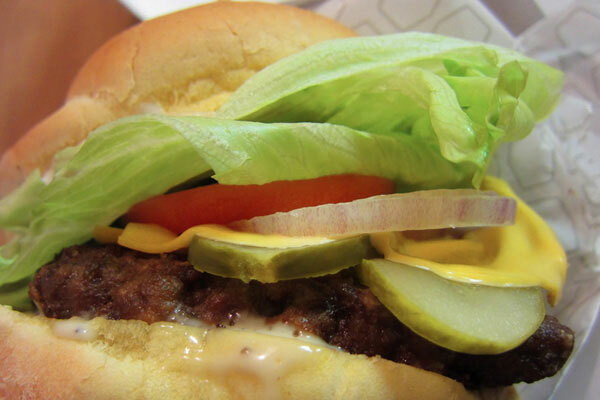 Some might say a burger is a burger is a burger–but not true! They all definitely taste different, and a lot of them look different, right? 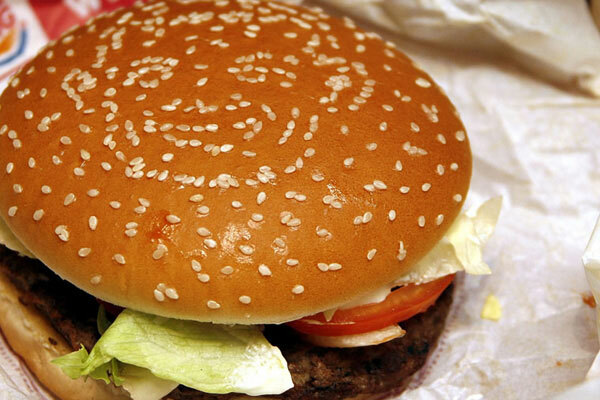 What good is a burger brand if it can’t distinguish itself from the rest of the herd? So here are a few major ones. Sorry, I can’t list them all, and I can’t let you taste them. But there are clues everywhere–so look (and read) closely. And if you can get through this write-up without immediately going out to get a burger for lunch, then you’re a better person than I am. 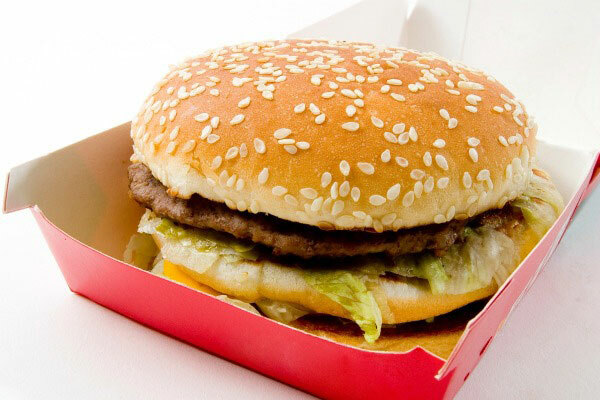 The burger shown above isn’t really a traditional fast food chain, which is why it looks so spectacular! But it’s not like a sit down restaurant either. It’s classified as “high end fast casual”. Whaa? 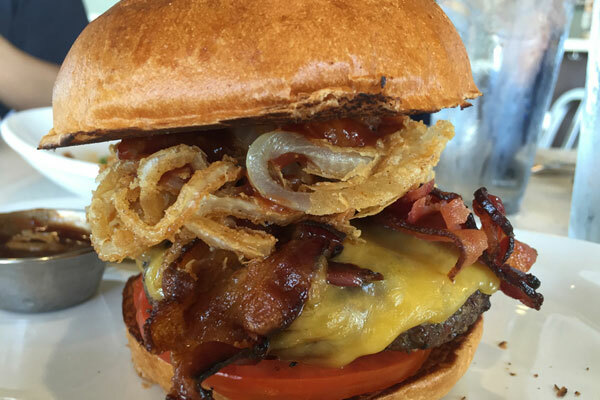 They rose to fame in 2006 when they got a shout on the Oprah TV show, and there have been many such “gourmet custom built” burger places since then. These guys pride themselves in establishing a counter culture to the burger mainstream by offering Korean BBQ, lamb, carne asada and crab, among other innovative ingredients on their menu. Founded and headquartered in San Diego, California, this company pioneered the 2-way intercom at its drive-thru restaurants, when customers would give their orders by talking directly at the mascot’s face. 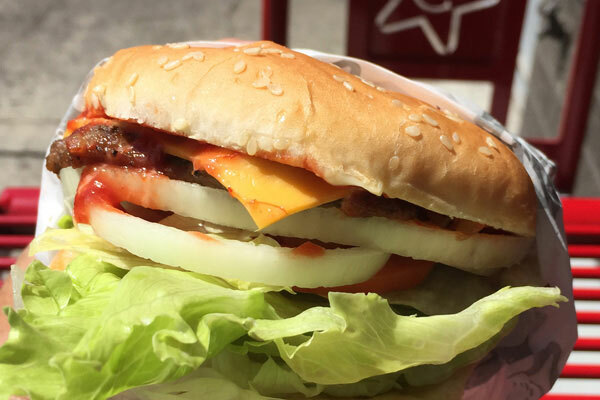 Although this signature burger put them on the map, they actually sell more tacos than burgers, even though they’re not known for Mexican fast food. Which burger giant is this? 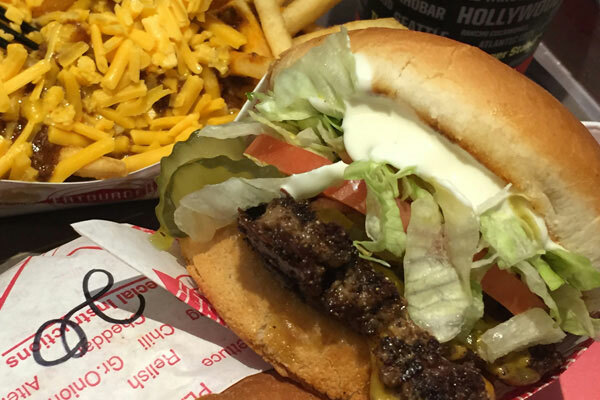 You cannot do a list on hamburgers without this one–especially if you’re from the West Coast. 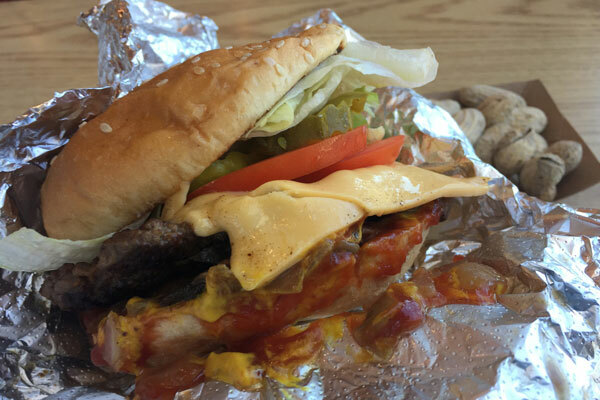 Their fame and notoriety has reached mythical proportions in the East, where my son, who goes to college in Boston, says his friends ask him about this legendary burger as soon as they find out he’s from California. Best known for their fresh cut fries and a “secret menu” that most people know about, this chain also pays their employees well. Managers have been known to make into six figures–did you know that? As a classic American success story, it’s hard not to love how this popular hamburger chain grew from a single hot dog cart, started by a husband and wife in Los Angeles. That cart multiplied into 4 carts, then became a full service restaurant, which grew to 24 restaurants, and today operates in over 1300 locations all over the world. “If it doesn’t get all over the place, it doesn’t belong in your face.” Ring a bell? 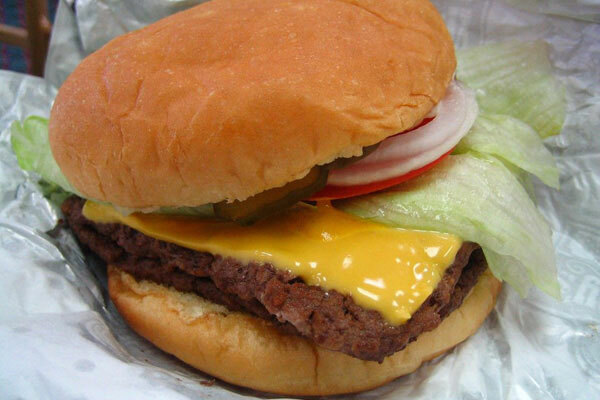 There’s too much to tell about this famous hamburger, so the more I say, the easier it gets to figure it out. So let’s just quote the famous astronomer Carl Sagan on this one, who used to day, “A galaxy is composed of gas and dust and stars–billions upon billions of stars.” Get it? In terms of global franchises, this burger chain is second to the real King. Still, that’s no small accomplishment, as there were a whopping 15,000+ locations worldwide as of last year. In fact, their most famous ad campaigns featured direct challenges to the number one guy, much like the way Pepsi went to war with Coke. And they were the first to start product tie-ins when they collaborated with a “Star Wars drinking glass” promotion back in 1977. Now they all do it. Just For Funsies This is the never ending debate, right? To see how these guys smackdown the best of the West Coast and East Coast, check out this Thrillist article and read how they duke it out. Bonus Burgers I’m not even giving you hints on these guys. 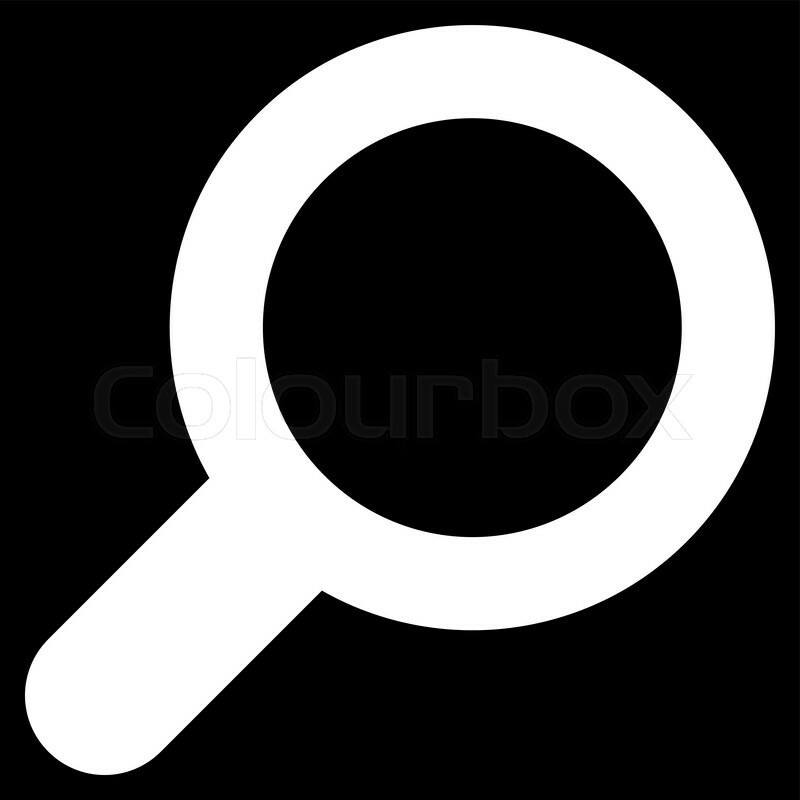 Look carefully at the images–you’ll see clues if you have a sharp eye and know your burgers. 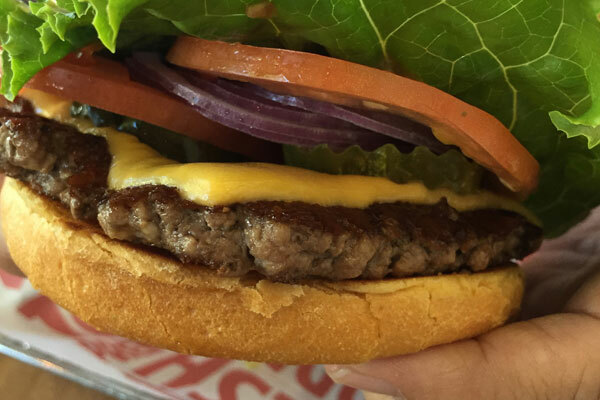 “Mmm, this is a tasty burger!” And finally, can you guess this one? 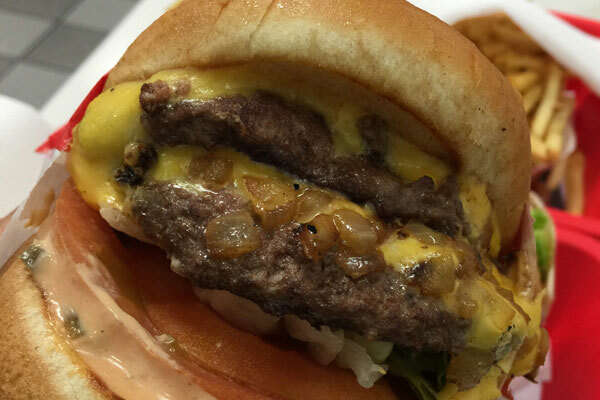 This is the most famous movie burger in Hollywood. Never has a hamburger played such a pivotal role in one of the all-time classic scenes. A cult classic. Hint: that thumb belongs to one bad m*ther f***er.